HO Scale Graffiti 2-Pack #16 - Weather Your Box Cars, Hoppers, & Gondolas! Weather Your Box Cars, Hoppers, & Gondolas. HO Scale Graffiti. DIRECTIONS: Cut your decals from the sheet. Place your decals in a bowl of warm water. They will curl up, and then straighten out again. Many are from pictures I have taken in the. As with any conventional waterslide decal, a glossy surface is a must for proper application. THIS SET IS AVAILABLE WITH EITHER WHITE OR CLEAR DECAL PAPER. DAVE'S DECALS. NO WHITE appear on decals. Decals must be cut out as they are not die cut. I can’t fix it if I don’t know about it. I’m pretty easy going and communication is key. ALL TRADEMARKS IF ARE PROPERTY OF THEIR RESPECTIVE OWNERS. HO Scale Graffiti 2-Pack #22 - Weather Your Box Cars, Hoppers, & Gondolas! Weather Your Box Cars, Hoppers, & Gondolas. HO Scale Graffiti. Cut your decals from the sheet. Place your decals in a bowl of warm water. They will curl up, and then straighten out again. NOTE: THESE ARE PRINTED ON A TRANSPARENT FILM SO THERE IS NO WHITE INK. HO Scale Custom Graffiti Decals #42. Cut your decals from the sheet. Place your decals in a bowl of warm water. They will curl up, and then straighten out again. Once they are laying flat again, they are ready to slide off of the paper backing and onto your item. Amtrak Diesels GE P40/42. We are located in small town Albert Lea, MN. We have 700 Sq.Ft. space with all your modeling needs. Anything from model paint to pine cars. and Talk to a Real Person. Love it or hate it, graffiti is everywhere. Decals are not shown actual size. 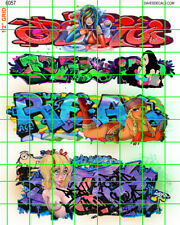 All of our graffiti decal sets are now laser cut. You only have to cut a couple of small tabs and soak the sheet in water. Trending at C $9.98eBay determines this price through a machine-learned model of the product's sale prices within the last 90 days. HO Scale Custom Graffiti Decals #38. Cut your decals from the sheet. Place your decals in a bowl of warm water. They will curl up, and then straighten out again. NOTE: THESE ARE PRINTED ON A TRANSPARENT FILM SO THERE IS NO WHITE INK. DAVE'S DECALS. NO WHITE appear on decals. Decals must be cut out as they are not die cut. CLEAR for white/silver or very light background. I can’t fix it if I don’t know about it. I’m pretty easy going and communication is key. HO Scale Custom Graffiti Decals #44. Cut your decals from the sheet. Place your decals in a bowl of warm water. They will curl up, and then straighten out again. Once they are laying flat again, they are ready to slide off of the paper backing and onto your item. 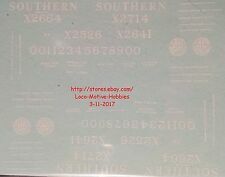 This is one set of Union Pacific UPY Yard Switchers GP15, MP15, SW1500, SD38-2, 2000 Diesel Locomotives Decals Microscale HO 87-1102 New Factory sealed. HO Scale Graffiti 2-Pack #18 - Weather Your Box Cars, Hoppers, & Gondolas! Weather Your Box Cars, Hoppers, & Gondolas. HO Scale Graffiti. They are sprayed with 4 coats of varnish so that they hold up to solvents. The end product is far superior to my competition. Cut your decals from the sheet. WoodLand Scenics. Photo Provided by PnP Trains & WoodLand Scenics. Gothic - Gold. Dry Transfer Decals. Sizes - 1/16, 3/32, 1/8, 3/16, 1/4, 5/16 in. Add Graphic Touches and Create your own Custom Layout with these Woodland Scenics Dry Transfer Decals. Features Give your layout, diorama or miniature scene authenticity with dry transfer graphics, numbers, letters and stripes. HO Scale Custom Graffiti Decals #46. The end product is far superior to my competition. Cut your decals from the sheet. Place your decals in a bowl of warm water. They will curl up, and then straighten out again. 12 total decals! I WILL ALSO INCLUDE A FREE FLAG STICKER (PEEL AND STICK). Water slide application adds a realistic touch. 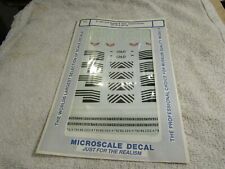 HO Scale Custom Graffiti Decals. Cut your decals from the sheet. Place your decals in a bowl of warm water. They will curl up, and then straighten out again. NOTE: THESE ARE PRINTED ON A TRANSPARENT FILM SO THERE IS NO WHITE INK. 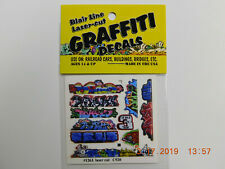 BLAIR LINE # 1260 N SCALE GRAFFITI SET # 11. All decals are. Love it or hate it, graffiti is everywhere. All of our graffiti decal sets are now lasercut. The easiest to use graffiti decals on the planet. Professionally printed by Microscale Industries, this HO Scale decal set consists of enough material to letter the Jersey Central's, historic Box Cab #1000. 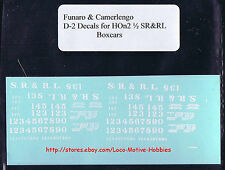 HO Scale Ghost Sign Decals MEGA SHEET #6 - Pre-weathered for your Structures! HO Scale Ghost Sign Decals. Cut your decals from the sheet. Place your decals in a bowl of warm water. They will curl up, and then straighten out again. Once they are laying flat again, they are ready to slide off of the paper backing and onto your item. 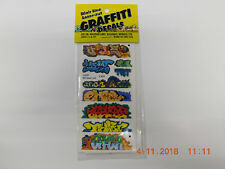 BLAIR LINE # 2259 HO SCALE GRAFFITI SET # 10. All decals are. Love it or hate it, graffiti is everywhere. All of our graffiti decal sets are now lasercut. The easiest to use graffiti decals on the planet. BLAIR LINE # 2261 HO SCALE GRAFFITI SET # 12. All decals are. Love it or hate it, graffiti is everywhere. All of our graffiti decal sets are now lasercut. The easiest to use graffiti decals on the planet. I WILL RESIZE THIS UPON REQUEST TO FIT ANY BUILDING IN YOUR LAYOUT. Trending at C $9.71eBay determines this price through a machine-learned model of the product's sale prices within the last 90 days. HO 1/87 scale by Microscale RSD-001. 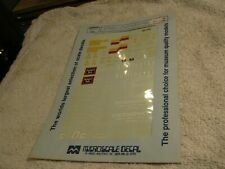 This water-slide decal sheet is custom made by Microscale Industries, Inc. so you are familiar with the quality. It has double-layer color print and an extra layer of clear for added strength. BLAIR LINE # 2260 HO SCALE GRAFFITI SET # 11. All decals are. Love it or hate it, graffiti is everywhere. All of our graffiti decal sets are now lasercut. The easiest to use graffiti decals on the planet. HO Scale Ghost Sign 2-Pack #16 - Great for Weathering Buildings & Structures! Cut your decals from the sheet. Place your decals in a bowl of warm water. They will curl up, and then straighten out again. Once they are laying flat again, they are ready to slide off of the paper backing and onto your item. HO Scale Graffiti 2-Pack #20 - Weather Your Box Cars, Hoppers, & Gondolas! 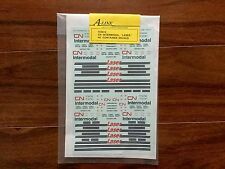 ShellScale Decals HO Scale HO140 - Norfolk Southern Diesel Data. Permissible Piston Travel • 132 - Max. Permissible Piston Travel • 133 - MU • 134 - MU - ACT/MR/AR - Green • 135 - MU - AR/MR/ACT - Green • 136 - MU - ACT/MR/AR - White • 137 - MU - AR/MR/ACT - White • 138 - MU - BCEQ/ACT/MR • 139 - MU - MR/ACT/BCEQ • 140 - MU - Dummy - Green • 141 - MU - Dummy - White • 142 - Notice: Under high ambient operation… • 143 - NS • 144 - NS • 145 - NS • 146 - Owned By A Bank…. RDG Reading. Cab Diesels. We are located in small town Albert Lea, MN. We have 700 Sq.Ft. space with all your modeling needs. Anything from model paint to pine cars. We also have around 600 Sq.Ft. Remove the decal and let it sit out of the water for 30 seconds to 1 minute. slide the decal onto the part surface. place decal into water for 5-10 seconds. position the decal using a toothpick or q-tip. WHAT IS LMH ?. I DO NOT manufacture or produce patches. This set of decals will decal ONE car kit. Decals adhere best to slick glossy surfaces. NEB&W New England Berkshire & Western. Decals For Rutland FLATCAR Series 2300/2600. Everything from crowd favorites like the corn dog to deep fried twinkies can be found in this 6 set series. Professionally printed on a high end digital press, the color and quality of these HO scale decals is exceptional.